Shea Coulée has called out Katy Perry for taking one of her signature RuPaul's Drag Race catchphrases. 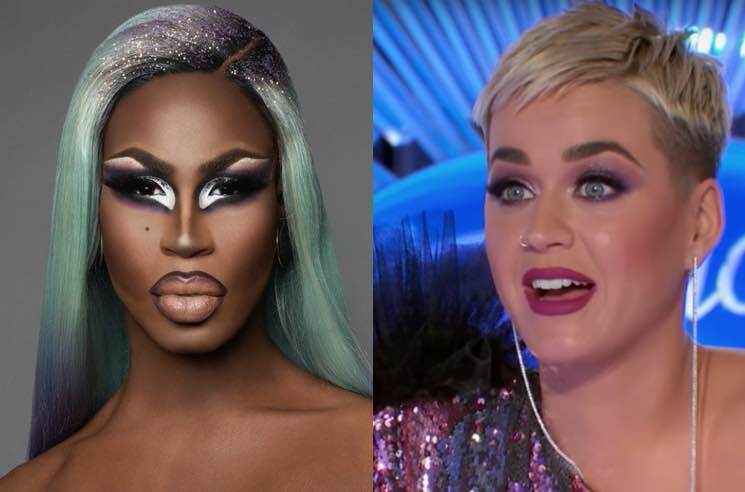 The drag queen was a finalist on Season 9 of the reality show, and her famous work room entrance line appears to have been appropriated by American Idol judge Katy Perry on Twitter in the early hours of this morning. Perry showed her support for Idol contestant Ada Vox (a returning contestant, this time auditioning in drag), telling her: "You did not come here to play, you came to slay" — with a lot of clapping hand emojis for emphasis. And while it may have been a well-intentioned compliment on Perry's part, Coulée was quick to claim ownership of the phrase, using as many hand claps to ask "Why you actin' brand new?" and demanding compensation. Notoriously vicious on social media, plenty of Drag Race fans have leapt to Coulée's defence. See some of the reaction from Twitter down below. It's not the first time the worlds of Drag Race and Idol have crossed over. Famed queen Adore Delano was a semi-finalist on Season 7 of American Idol (as Danny Noriega) and went on to compete in Season 6 of RuPaul's Drag Race and Season 2 of All Stars, while Courtney Act competed on the first season of Australian Idol as well as Season 6 of RuPaul's Drag Race. Watch Ada Vox's audition that inspired Perry's tweet below.